I had to replace the hard drive of my Inspiron 15z 5523. The new hard drive is the exact same model as the one it replaced. This laptop also comes with a mSATA card, originally used as a cache drive. I'm now trying to re-install Windows 8.1 and get the laptop to work as it did before the HDD malfunctioned. 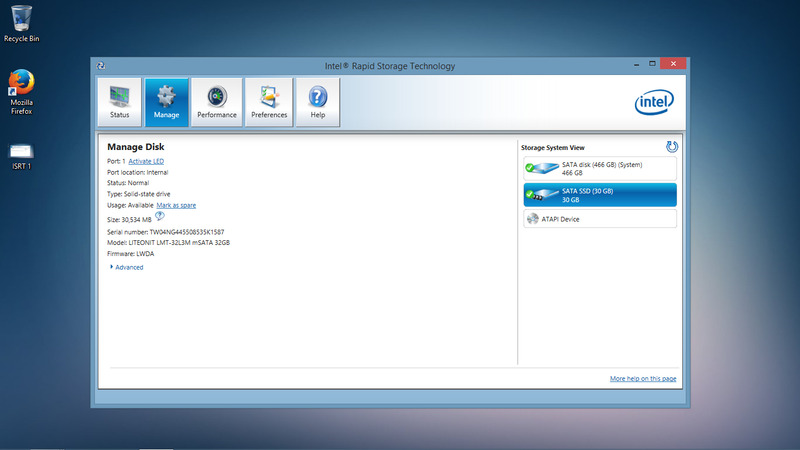 I used this Dell tutorial to install Windows 8.1 with Intel Smart Response Technology; I skipped the first two steps and started from step 3 by setting the SATA Operation to Intel Smart Response Technology in the BIOS menu. When I got to the "Where do you want to install Windows?" part of the installation process (see Screenshot 1) I decided to create a partition that used all of the space available on Disk 1 (HDD), I didn't create any partitions on Disk 0 (mSATA). About 3 other small partitions were automatically created on the HDD. I tried to load the ISRT driver during this step, as instructed in the tutorial, but no drivers where found on the USB stick that had the correct (double-checked) ISRT driver; so I decided to install Windows on the main partition of the HDD and install the ISRT driver manually after the OS was installed. ISRT was correctly installed, but after opening it I realized that the Acceleration tab was missing (see Screenshots 2 and 3). I can see that both drives are working correctly, but they don't seem to be working as a RAID array, which I think - but I'm not completely sure - was the original setup; nor does it say that the mSATA is accelerated. Where did I go wrong? Should I have done something else in the BIOS menu before starting the Windows installation? Does this have to do with the fact that no ISRT drivers were found during the OS installation? What should I do? Drive 0 should not display in the Windows setup if the IRST SATA operation is enabled.